While most homeowners see kitchen cabinets as mere boxes of a nuisance, they are actually not. They are a great addition to a kitchen, and the owner needs to make them as presentable as they can. One of the benefits to this is the aesthetic value so badly need the kitchen’s pattern to reflect. In addition, cabinets will always save on space. One does not have to worry about clutter when they have perfectly lined shelves in which to stow away cutlery and other items. There is a perfect sense of order and beauty in a kitchen whose cabinets look designed to blend in. Given the changing nature of the modern kitchen, the homeowner will certainly need this edge. 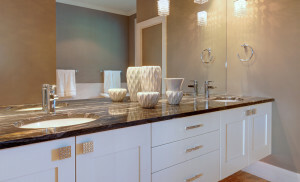 Having cabinets personalized allows the owner to use them for specified purposes. Even though most cabinets will do just fine, it helps to have a design that works for the specific items in the kitchen. As indicated earlier, the nature of the modern kitchen is that it is multipurpose. Interior landscaping is great, but only if it works to help the items in the various rooms of a residence blend in. Custom kitchen cabinet design professionals know how to make the cabinets in such a way they fit in with an existing pattern. It does not help to have items that look out of place after spending so much on using the right tiles, grouts, and counters. Even though modern day kitchens are larger than their traditional counterparts were, there is still a need for homeowners to economize on the available space in a bid to de-clutter the kitchen. Custom cabinets will always work around the available space allocation. Generic types, on the other hand, simply come from the market in standard sizes that do not affect the internal environment of the kitchen. Some owners will implement do-it-yourself approaches when handling the installation of kitchen cabinets. However, it is highly recommended that one get a professional to do the job. Cabinet experts have been in the field for years. As a result, they have an intensive knowledge of the kitchen environment and can offer valuable advice as well as service. While most homeowners worry about prices, it is always good to overlook this factor because the results are always worth it.